The Rolls-Royce Wraith is fitted with a 6.6-liter V12 engine producing 624hp and 605 lb-ft or in the case of the Black Badge edition, 642 lb-ft. An 8-speed automatic transmission powers the rear wheels and performance is rapid. Both interior and exterior quality levels are flawless as is the ride quality which remains silky smooth regardless of road conditions. Air suspension, power-closing rear-hinged doors and an 18-speaker audio system are just the start with an unrivaled level of customization options available on the Wraith, limited only by finances and imagination levels. 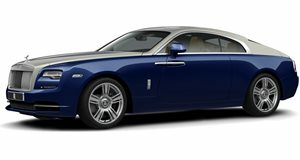 Rolls-Royce has long been the purveyor of some of the world’s finest luxury automobiles, the Wraith is the most performance-oriented model in the range but it hasn’t resorted to anything as crass as adding stiffer suspension or removing luxuries to save weight. 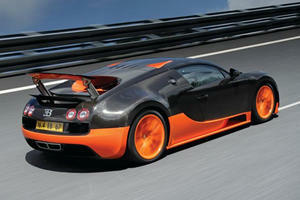 No, the additional dynamism comes from a more powerful engine and subtle suspension revisions. 2018 sees some additional equipment and a dollop more power being added. It becomes clear as you step into the Wraith that the designers wanted to make the transition from luxury yacht to luxury coupe as seamless as possible. The massive rear-hinged doors and exquisitely detailed leather, wood and metal trim are not overtly nautical in design but the generous interior dimensions and high driving position does make one feel like they are piloting something rather substantial. While the Wraith is as long as some minivans it makes use of the available space by filling it with thick pile carpets, acres of fine wood veneer and some of the most comfortable seats around. 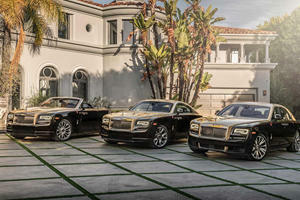 Four adults will fit comfortably in the Wraith and there is enough space in the tapered rear end for their luggage too. The Rolls-Royce Wraith approaches the performance coupe segment from a very different angle compared to just about every other manufacturer. Based on the huge Ghost sedan it was never going to be a lightweight sports car, instead it offers commendable body control and excellent road-holding while still isolating its passengers from the harsh realities of the outside world. Ride quality is better than most luxury sedans and despite its ties to parent company BMW, the Wraith has its own unique character that is closer to a what a slightly more urgent Rolls-Royce Ghost would feel like rather than a softly-sprung 7-Series. With a 6.6-liter twin-turbocharged V12 producing 624 horsepower and 605 lb-ft of torque, an 8-speed automatic transmission sends this prodigious amount of power to the rear wheels. Acceleration is superb and while the 60mph sprint takes a shade over 4-seconds to complete it is the way that the Wraith effortlessly whispers past slower moving vehicles that really defines its character. The immense levels of torque at all engine speeds neutralize its substantial curb mass and a mere prod of the throttle will have the large coupe pressing you into the h leather seats. If only the very best will do then the Rolls-Royce Wraith Black Badge trim may be more to your liking, it produces an additional 52 lb-ft of torque to bring the total up to 642 and with unique transmission mapping provides some additional thrust for the discerning gentleman or woman in a hurry. The Wraith comes equipped with a vast range of standard equipment including adaptive headlights with automatic high-beam control, auto-adjusting air suspension, power-closing doors, head-up display, lambswool floor mats, power front seats with massage function and a 10.3-inch touchscreen with integrated navigation and surround view camera. The Black Badge adds a dollop more torque as well as sportier suspension settings, carbon-fiber interior trim, darker inlays and design accents as well as upgraded brakes. This is just the tip of the iceberg as it were, as the level of customization and personalization available to each customer is only limited by their imagination and bank balance. Any aspect of the Wraith may be designed and built in a totally bespoke way, from specialized timber finishes and unique inlays to one off body styles the choices are endless. There are of course a range of off-the-shelf packages and individual options to choose from too and include items such as adaptive cruise control, starlit headlining, two-tone paint options and additional advanced driver assistance systems. 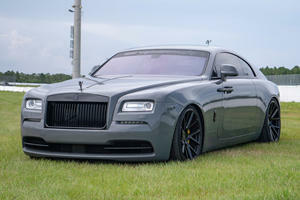 Assessing the Rolls-Royce Wraith based on the mundane attributes lesser cars are judged by is missing the point. Its pricing is not based on the sum of its parts either, which can to a great extent be dictated by potential owners through endless customization options. The Wraith is rather an extension of one’s personality and lifestyle, and by its very nature elevated above the mundane role of getting you from A to B, or in this case luxury yacht to seaside villa. That it offers crushing performance, peerless quality and a sublime ride is just gold-flaked icing on an already magnificent cake. Jozef Kaban will lead a new era of Rolls-Royce design. The bespoke Rolls-Royce Ghost, Wraith, Dawn, and Cullinan pay homage to the Lunar New Year. Which is exactly what these refined luxury cars needed.